Writer Clint Sears (Halloween Tales) is gearing up for the English premiere of his much anticipated Japanese/American mini-series Crow’s Blood. El Rey Network will be airing Crow’s Blood as part of their “Horror by Numbers” Halloween Marathon this weekend. We caught up with Clint to talk about the evolution of Crow’s Blood, what it was like filming in Japan and we also talk about all things Halloween. MV: Welcome back to Movie Vine, Clint! 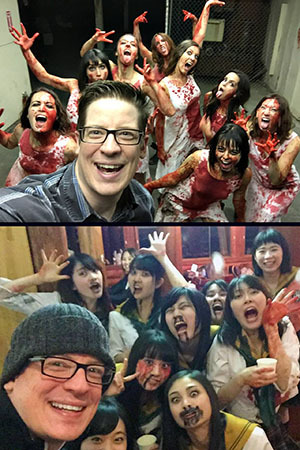 When we caught up with you last year Crow’s Blood was getting ready to premiere in Japan. Now it is finally making its way stateside. Congratulations! SPOILER ALERT! Ha, but seriously, would you like to take a shot at what was actually said there or how that person feels about our show? It’s completely impossible. I know the show was very well received but this has been my last year every time I have tried to google or search for reactions on my own. I took a little Japanese in school, I remember nothing, but it is a beautiful, poetic language filled with nuance and subtlety and the translation programs just treat every thing like a terrible MadLibs. People would ask me, “How’s the show?” and I would have to reply, “The guitar is on top of much golden chowder” with a knowing, confident look and hope they would just walk away. MV: I think that’s an intriguing review. Now I want to know what ‘laughing bent limb abnormalities’ means. Let’s do a quick recap on Crow’s Blood for anyone who may have missed our last interview (you can read it here). How did you first become involved in this project? Clint: Darren Lynn Bousman (Saw 2,3,4 and J.J. Abrams look-alike) and I have been working on stuff for quite a while and have been friends for … forever. He was approached by our producers Sean E DeMott and Riki Nishimura to create a new east meets west horror project along with Yasushi Akimoto. MV: So this was a very special collaboration since it was the first of its kind in original programming. Was it difficult to blend a western voice into the existing story without compromising the original tone? Clint: There were a few unexpected challenges… I was surprised by how open ended some Japanese narratives can be and, of course, here, we like to explain every detail that we can and, often, tie every story thread up in a nice little bow. So I found a lot of opportunity to connect dots that weren’t necessarily there in the beginning and there were a few, simple cultural differences regarding HOW things where done versus how I simply and incorrectly assumed they would be done, such as the fact that teachers would not sit at a desk because they stand behind podiums… several little things like that but surprisingly, there were not nearly as much as I thought there would be considering I was flying fairly blind. MV: Without giving too much away, would you mind sharing the story behind Crow’s Blood again for our new readers? Clint: Sure, at its heart it’s the story about a strange girl who enters a high school and slowly but surely begins to disrupt the social and power structure she finds there. Along the way we have a mystery, a love story, some action and hopefully a laugh or two. MV: Audiences will have a couple different ways to watch Crow’s Blood on El Rey Network over the weekend (beginning on 10/28 at 6PM ET). The first being dubbed in English and the second in the original Japanese language with English subtitles. Which do you prefer? Clint: I haven’t seen the dub yet and I am positive it will be absolutely wonderful but I think that the actors re-translated from the Japanese performances and then added their own spin of course, so just because I am a raging narcissist and because I hope the subtitled version is back to the original script I will say the latter. I’m half joking there but I do always prefer to watch in the original language whenever possible. 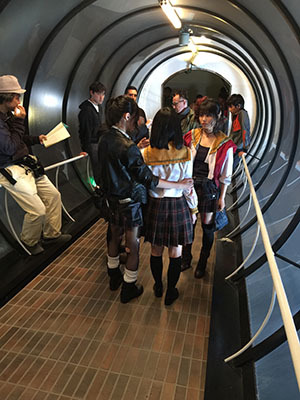 MV: So many of our great American genre films have been inspired by a Japanese story or film. Do you think there will be a reimagining of Crow’s Blood some day with the story and characters based in America? Clint: There was talk for a while… I can totally see it. Fortunately for Crow’s Blood though is that I think a lot of the fun is the very east meets west that comes through its pores when you watch. MV: You mentioned in our last interview how much you enjoyed working in Japan and how the experience sticks with you. Now that some time has passed what do you find yourself missing the most about Japan? Clint: So, so many things. The people, the food, cleanliness, the efficiency in every aspect of their lives, the lack of crime… I MISS IT ALL JAN! There were lots of little moments when Japan clicked for me and I remember one in particular. I love all food but I hate the word “foodie” because it’s just phonetically a very dumb sounding word that no one should take seriously but also because I am NO snob. I love ALL food, from the grungiest, delicious brats from a 3 a.m. cart, to a new way to fry something that maybe shouldn’t be fried, to the finest restaurants in town. So when there one night I annoyed everyone by swinging into a McDonald’s to see how the menu was different and try some of the interesting items. I settled on a chicken sandwich with soft bacon (that’s how it’s preferred, kind of like Canadian bacon) and that sandwich… it was better than 99% of all chicken sandwiches I have ever had. I couldn’t believe it. It was perfect. I looked to our translator who was very well traveled and said, “seriously, why is this so good, it’s just a fast food sandwich, this doesn’t make sense” and he just calmly said, “in Japan strive for perfection in everything that we do”. It just clicked and it’s really true. Full disclosure, I’ve worked in the lower-end food industry and there were many times I should have but definitely did NOT strive for perfection. MV: Soft bacon. That is exactly how restaurants make it in China too. It took me a long time to get used to that. I’m an extra crispy bacon kind of person. I think the strangest thing I ate while living in China was a chicken sandwich at KFC. It was chicken breaded in oats and stuffed with shrimp. Although, since I couldn’t read the Chinese menu the shrimp was quite a surprise. I actually thought it was raw chicken. Otherwise, I may have enjoyed it. Clint: Crispy all the way for me too, almost to the point of being burnt! But again, I have the brain of a goat so I also did not balk at the soft bacon either but what you just described, that’s too much, ha, biting into what you believe is raw chicken sounds absolutely traumatic! There can’t really be any coming back from that can there? I am the absolute worst though because that aside, I now can’t stop thinking about shrimp stuffed chicken and how much I want to try it… I have a problem. MV: It was an interesting sandwich. I am really excited to finally watch Crow’s Blood and just in time for Halloween. What are a few of your favorite films that you have to watch every Halloween? Clint: Tales of Halloween available now on Netflix, Tales of Halloween available now on Netflix, Tales of Halloween available now on Netflix… I don’t have any in heavy rotation I suppose but full confession, I don’t really watch anything over and over again, I think I am a bit of an anomaly that way, but I’ll definitely check out things to get in the spirit. I also just really love all the Halloween episodes of my favorite TV shows too, it’s silly but ever since I was a kid they have always felt a little more special and fun to see your favorite characters dressing up as another character. 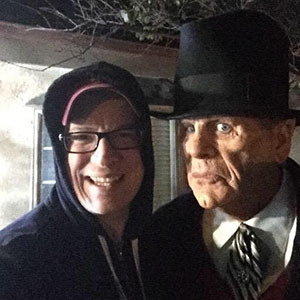 MV: Speaking of Tales of Halloween, it’s really cool that it has become a Halloween tradition in its own right. Will you be doing any live tweets of the film this year? Clint: I would love too. I don’t think there is anything scheduled but we should. We can also just have people call me and I’ll give a running commentary for the 10 minutes ours comes on. MV: Now that would be fun. Charge per minute. Nice little side business during Halloween. 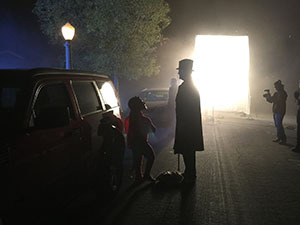 You put the Tales of Halloween neighborhood through the ringer in “The Night Billy Raised Hell”. Where did that story come from? Clint: A couple of things but the main one being that I read a lot of O Henry growing up and I knew the beats of my favorite short stories always had to have that really nice twist as a button at the end so I knew I wanted something fun but it was about that moment when… ah I almost said too much. A lot of it also came from just remembering my own childhood and that intoxicating mix of excitement and fear that drew you into the night without supervision or a safety net. In hindsight it’s kind of fun to realize that time in my childhood when I felt really independent, allowed to leave the house at night, I was dressed up as a cardboard robot or pirate that was so poorly put together, by myself thank you very much, that everyone believed I was Rambo. MV: As a kid growing up in Kansas City what were some of your favorite things to do for Halloween? Clint: It’s so funny you’d ask that because we have really pretty amazing haunted houses there and Darren and I just recently revisited one of them last week. It held up pretty good. My least favorite Halloween was when all of the sudden I was at a “boy – girl party” in middle school and all of the sudden I realized that we were done trick or treating, I don’t know why it hadn’t dawned on me sooner but I can tell you, staring awkwardly at girls on the other side of the room while listening to Boyz to Men will never be as fun as filing a pillow case full of candy. MV: That’s funny. Did you ever pull any tricks like Billy? Clint: I am proud to say I did not. I was never into the vandalism thing and just never understood the thrill. We most definitely did creative pranks but never anything destructive. 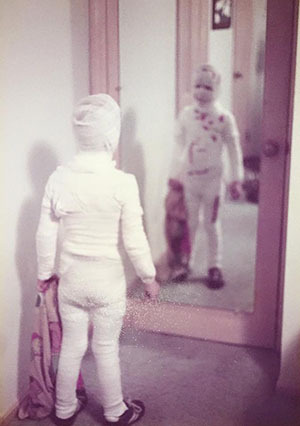 MV: I have very vivid memories of trick-or-treating as a child. The best part of the night was sorting through the candy. What was your favorite candy that you scored on Halloween night? Clint: Well there was always that one house that supposedly had the fabled full sized candy bars right? I can’t remember if I ever actually got one but I know that was always the holy grail. Looking back I think that was probably more for bragging rights for me because I was and still am more of a pure sugar, non-chocolate type of candy guy. I also love novelty of any sort so like Pop Rocks, gummy everything and sour candy too. MV: I never received the full sized candy bars. I think they’re a myth. However, I did get a slice of packaged cheese once. What’s the craziest non-candy thing that found its way into your trick-or-treat loot? Clint: Haha, that’s wonderful. How did that happen? Did they offer a loose menthol cigarette and a half empty can of Raid too? Let’s see… I know that I have to have received a pencil or toothbrush before because I threw that in to Tales of Halloween, I just remember a general, vague anger about anything that didn’t give me my sugar fix. MV: Well at least it wasn’t a rock. Before we close are you able to discuss any of your other projects in production? I know that you have a few things in the works, but at least one is still under wraps. Clint: Yes and I can actually just now talk about that one too… The Lust Experience’s Mid Season Event “Anointment” should have tickets on sale by the time this comes out. It is the first part of our follow up to last year’s Immersive Theater and ARG – The Tension Experience. I also worked on a horror film that everyone is very proud of called “St Agatha” and we should be seeing more announcements about that very shortly. MV: Last question, in honor of Crow’s Blood I have to end with a cloning question again. What historical figure would you like to see cloned, and what advice would you give him/her for navigating life in the 21st century? Clint: Oh wow, I wasn’t ready. What a great question. You know, just because I am still crushed I am going to go ahead and say David Bowie just so he can live forever and it’s a bit of a cheat because I think he’d be giving us advice for navigating the rest of the 21st century. MV: Yeah. Great answer! Thank you for hanging out with Movie Vine again, Clint! We are looking forward to finally seeing Crow’s Blood. Clint: I always have fun chatting with you and I hope we can do it again very soon! *Be sure to check out Crow’s Blood on El Rey this weekend and follow Clint on Twitter (@clintisawesome) for more information about his upcoming projects. Jessica Cameron : Beauty Trumps Terror! There are currently 1 Comment on More Crow’s Blood with Clint Sears. Perhaps you would like to add one of your own? This is so exciting! Clint Sears writes incredible storylines. (Scary with humor always catches me off guard.) Crow’s Blood cannot get here fast enough. Thank you for the interview and more information on upcoming projects of Clint Sears!